I’ve been experimenting a bit more lately with pumpkin than I usually do. Since we can’t exactly bake a sweet potato and pumpkin casserole for the dinner table, I wanted to come up with some not-so-traditional dishes using pumpkin that all of us can get behind! 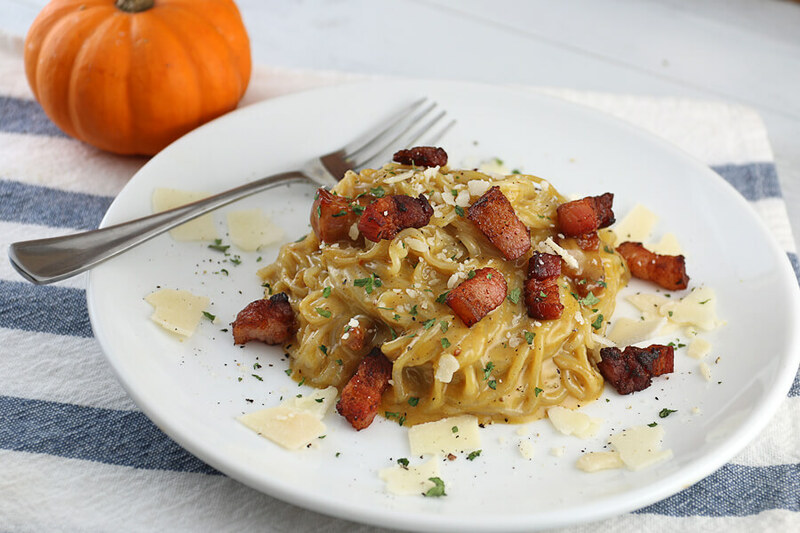 This pumpkin carbonara is an AWESOME meal, and everyone will definitely be wanting a second helping after they get their first bite. While I do love the sweet aspects of pumpkin (check out these Pumpkin Snickerdoodle Cookies, or these Pumpkin Pie Blondies), I really love the savory aspects also. 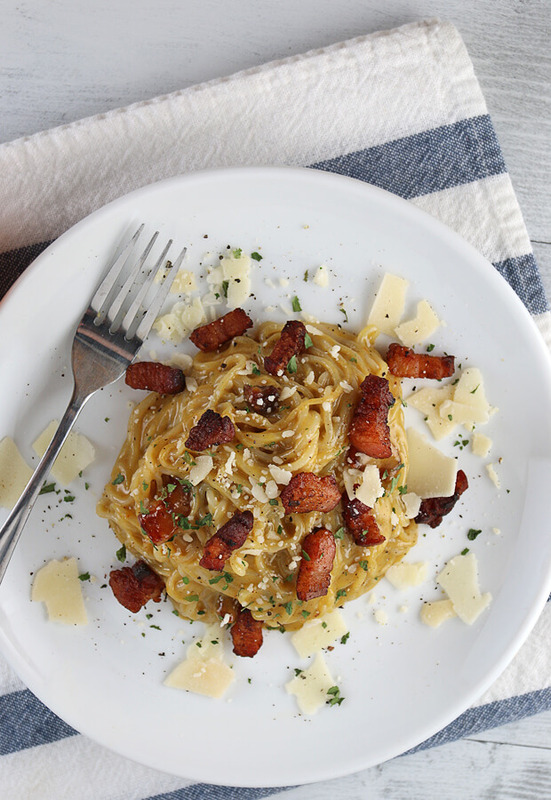 The crispy pancetta is the perfect addition to this dish. It really ties together that slightly sweet flavor of the pumpkin sauce by bringing elements of earthy, savory, and richness. The parmesan cheese really helps thicken the sauce, but also brings a bit of umami to help with the dish altogether. The pumpkin and sage as also a classic combination – just not usually thought of in a dish like this. I truly hope you get the chance to wow your family with this one like I did with mine. 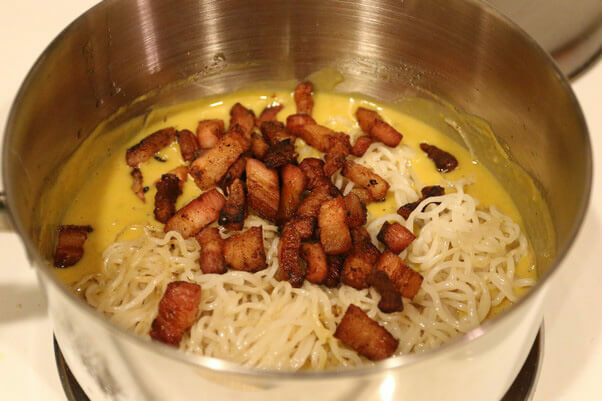 They couldn’t believe that the noodles were very low carb – as you will see in the recipe, dry frying them is the way that I always do it now. Without taking some of the moisture out of the noodles, you’re left with a very strange consistency and sometimes a bad flavor. When you dry fry the noodles, some of the texture problems seem to disappear and the flavor is definitely not fishy tasting at all. Enjoy! 1. 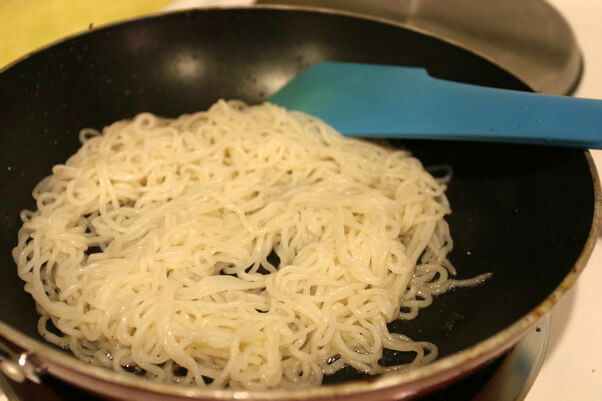 Rinse off the shirataki noodles under hot water for 2-3 minutes. Then dry them off completely with paper towels. Put aside. 2. Chop pancetta and place into a hot pan to sear on the outside. 3. In the meantime, place butter into a small pot and let brown. Once it starts to brown, mix the sage into the butter. 4. 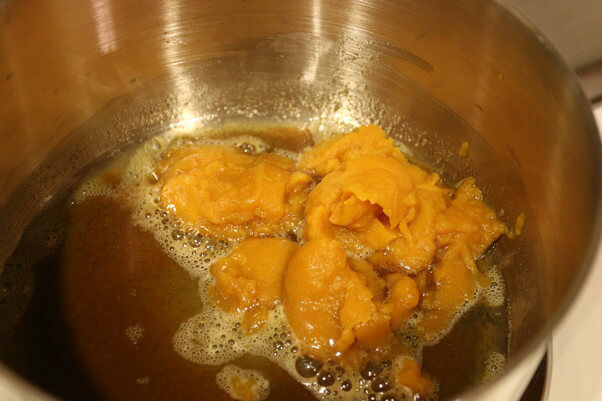 Once the sage is mixed in, add your pumpkin puree and mix together well. 5. By this point, the pancetta should be browning up nicely. Once it’s crispy on the outside, remove from the pan and save the fat. 6. 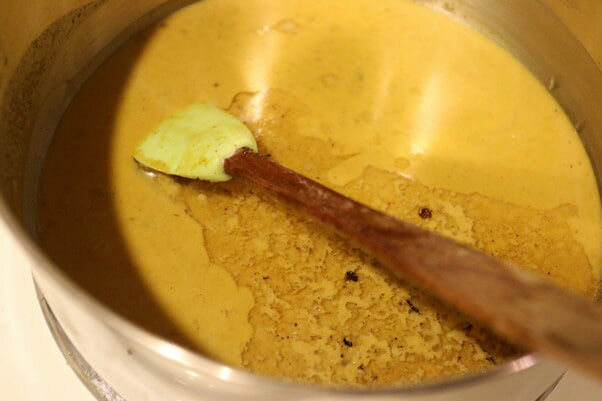 Add heavy cream to the pumpkin puree sauce and mix together well until everything is combined. 7. 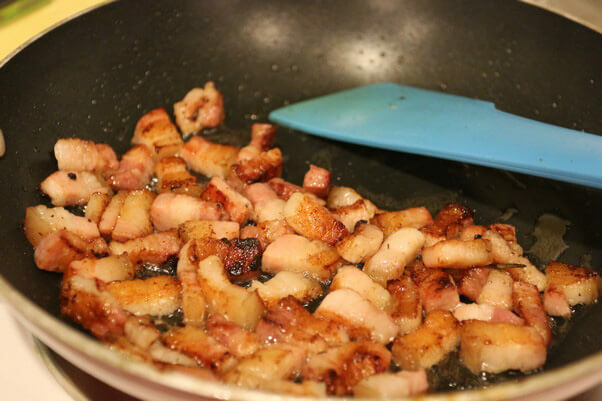 Add pancetta fat into the sauce and mix again until well combined. Let the sauce simmer on medium heat. 8. Turn the pan that had the pancetta in to high and add the shirataki noodles. Dry fry them for at least 5 minutes until a good amount of steam has come out of them. 9. Add parmesan cheese to the pumpkin sauce and mix together well. Turn the heat to low. 10. Continue to stir the sauce until you can scrape a spatula through the sauce and it takes a moment to come back together. 11. Add noodles and pancetta into the sauce and toss well. Add 2 egg yolks and mix into the sauce. 12. Serve with extra parmesan and pancetta to taste. 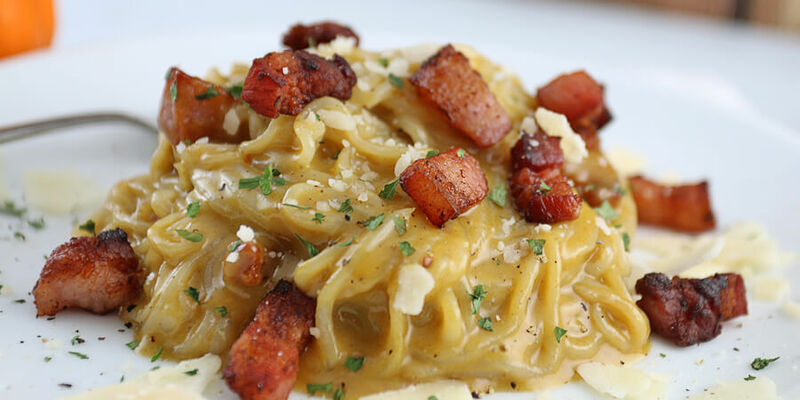 This makes a total of 3 servings of Keto Pumpkin Carbonara. Each serving comes out to be 384 Calories, 34.7g Fats, 2g Net Carbs, and 14g Protein. 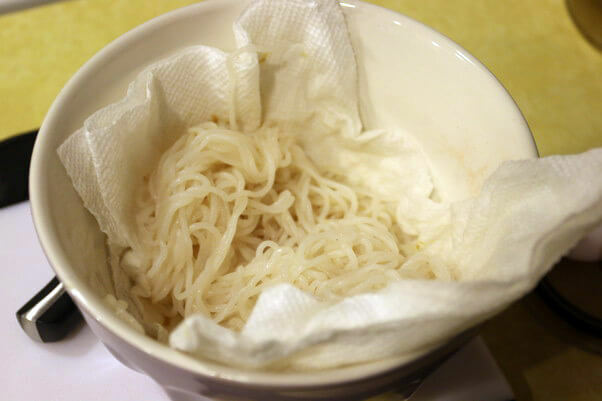 Rise off the shirataki noodles under hot water for 2-3 minutes. Dry them off completelyand set aside. 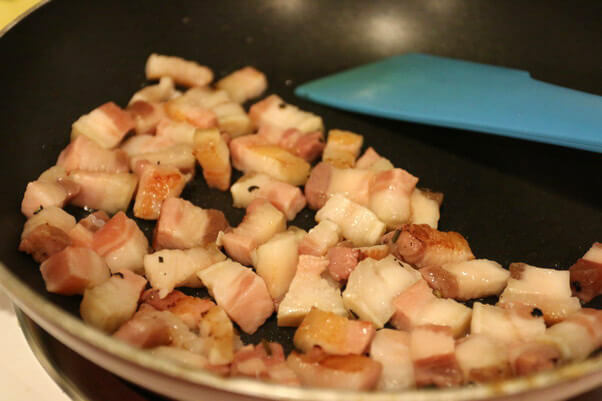 Chop pancetta and place into a hot pan to sear on the outside. Once crisp, remove from the pan and save the fat. 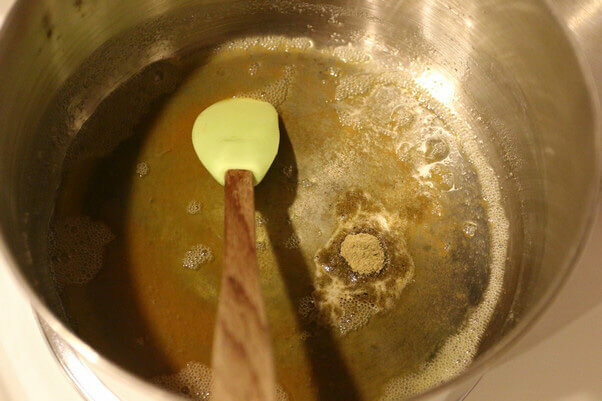 Place butter into a small pot and let brown. 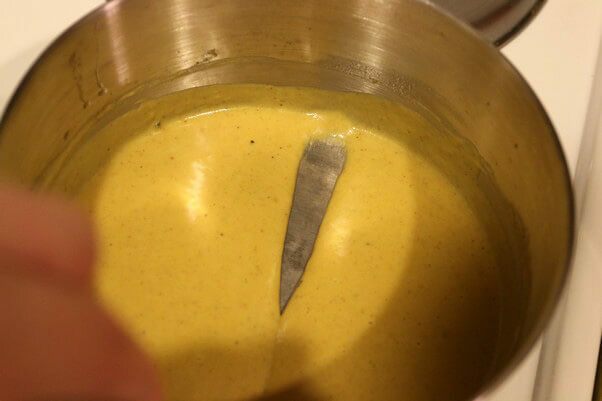 Once it starts to brown, mix in the sage and pumpkin puree. 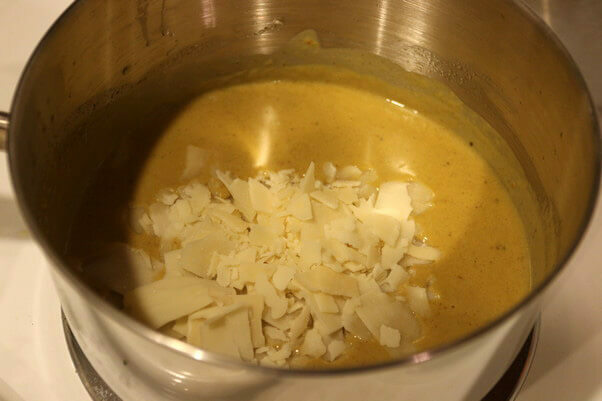 Add heavy cream and pancetta fat to the pumpkin puree sauce and mix together well until everything is combined. Turn the pan that had the pancetta in to high and add the shirataki noodles. Dry fry them for at least 5 minutes until a good amount of steam has come out of them. Add parmesan cheese to the pumpkin sauce and mix together well. 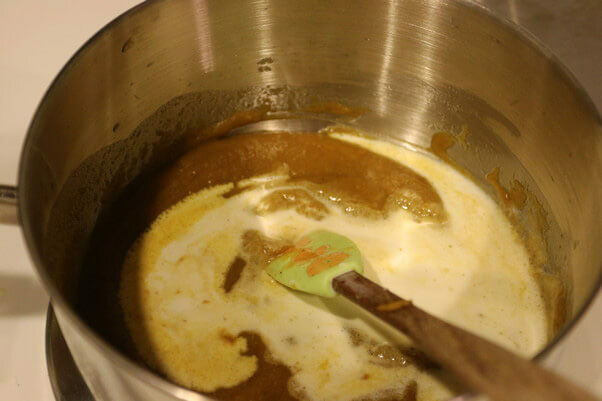 Turn the heat to low and stir until sauce is thickened. Add noodles and pancetta into the sauce and toss well. Add 2 egg yolks and mix into the sauce.